Every year, the Pantone Colour Institute names a colour of the year. This is the shade that is the hot pick for interiors and brands, critical to the design world and intended as a reflection of what’s trending and set to trend in the months ahead. Recent colours of the year have included an earthy, mossy green, exotic marsala, a radian orchid and vibrant tangerine. 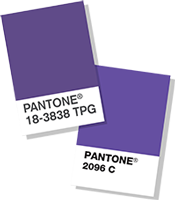 This year is the turn of the sophisticated 18-3838 Ultra Violet – a shade Pantone describes as “communicating originality, ingenuity and visionary thinking.” It goes on to say that the rich, vibrant purple is also complex and contemplative, with a hint of mystery, symbolic of the night sky. Purple is often thought of in the context of creativity and artistic vision, with Pantone citing Prince, David Bowie and Jimi Hendrix as the original champions for Ultra Violet through their album artwork and stage costumes. For 2018, ultra violet is getting an update however – it’s complex, rich and nuanced and Pantone says, an expression of non-conformity, creativity and individuality. At the other end of the spectrum, purple is often associated with mindfulness – something which is growing in popularity with countless apps, wellness gurus and increasing awareness of the need to switch off and meditate to escape the stresses of daily life dominating social media and blogs. If you’re looking to give your home or workplace a makeover and want something unapologetically contemporary, inspiring, energising yet relaxing, why not incorporate this year’s Pantone colour of the year into your décor? Here are a few ways to harness the power of Ultra Violet. 1. As a feature wall: If you’re hesitate to introduce too much colour, a feature wall is an ideal way to incorporate a more vibrant tone without fear of it dominating the space. Try Ultra Violet as a feature wall. It will stand out against crisp white so you can keep the rest of your space clean and crisp. 2. On the floor: You don’t have to go all out with Ultra Violet. Try adding it to the floor in the form of a rug or stair runner. 3. Soft furnishings: The most subtle of changes is to add Ultra Violet soft furnishings such as cushions, throws or curtains. This is just as effective in a lounge or bedroom as it is in a reception room or break out space. 4. In art: If you’re looking for a focal point, consider commissioning a piece of art using Ultra Violet.